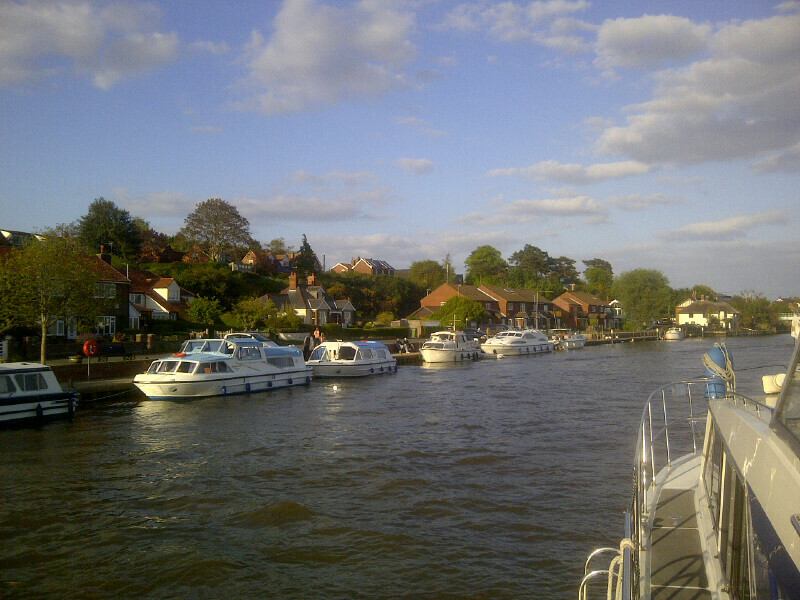 These are the details of our cruise on Sunday the 17th May 2015 from Brundall down to Great Yarmouth and then via Lowestoft to Ramsgate the next day, which involved cruising out of the Yarmouth Road past Lowestoft and then nearly due South well offshore of the Shipwash and Sunk buoys( marking the inshore sandbanks) and then east of Kentish Knock to finally cruise SSW towards North Foreland and down to the Ramsgate buoyed channel. This trip was undertaken with another Broom Boat, Ikon, with Chris and Maggie Cole and guests on board from the Owners Club, and consisted of a passage of around eleven hours at 10-11 knots through the water. The sea passage had a brief following tide for the very first part of the passage and then an adverse north-going flood tideor 2-3kn for most of the rest but with the 2 knot near-Spring tide speeding us to our destination at Ramsgate. The prevailing breezes were predicted as being from the west to south-west with sea mostly slight at first and then smooth/slight later, but then the wind went round to the south-east for a while later, which made approaching Ramsgate across the shallower water uncomfortable with wind against tide. There was a first perceived a danger of a partly beam swell from the South West across the Thames Estuary in mid-passage, but the breeze was due to moderate to 8-12 knots and waves at 0.3m were forecast to lessen by then. In the event, this part of the trip was almost dead calm and the most comfortable Thames estuary crossing I could recall. 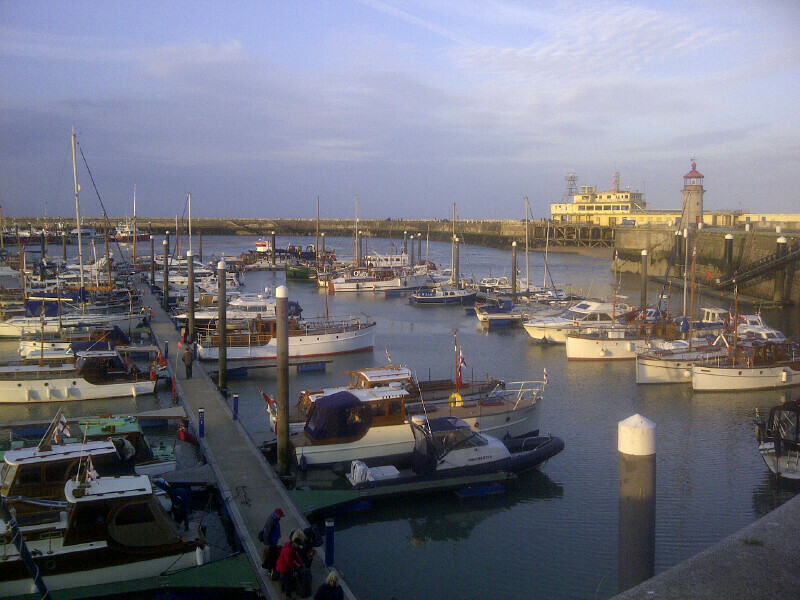 It was the last hour approaching Ramsgate that produced a moderate sea. Positioning for this passage had already been undertaken on Saturday evening and took a couple of hours and around 12 further nautical miles down the mid Yare at Brundall, under the Reedham Swing Bridge and on to the lower Yare where we moored up at Berney Arms for the night. 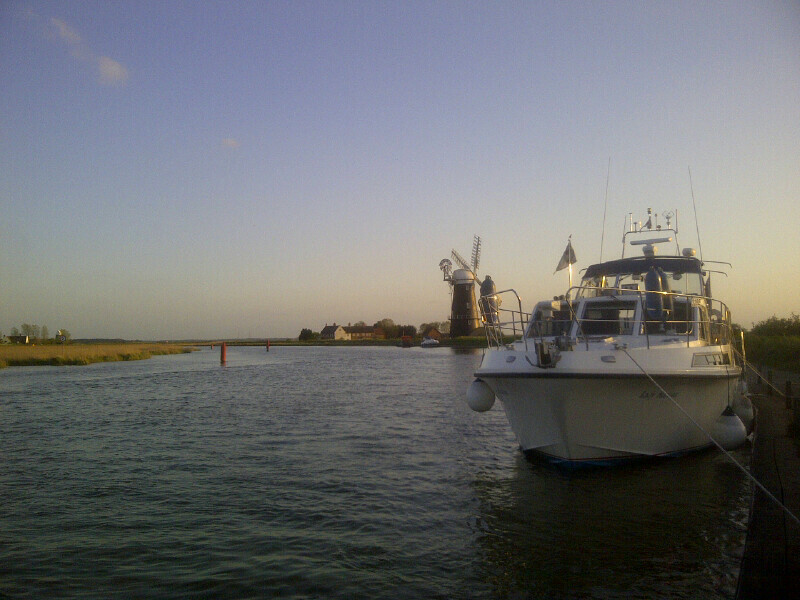 First thing on Sunday we then cruised across Breydon Water for some 45 mins before we passed under the Breydon and Haven bridges (that lifted for us by prior arrangement around 9.00am LT) before we then steamed along the inner harbour and beyond the piers into the Yarmouth Road to enter the sea proper by 9.30am Local Time. We were also accompanied on this earlier passage by our dog Max and then a hire car was available on Monday from Ramsgate to drive him back as he was being accommodated in kennels for the subsequent visit to Dunkirk. I could then drive back so we would then be ready for escorting the Dunkirk Little Ships when they make their historic passage on the following Wednesday/Thursday. The passage waypoints I planned took Lady Martina some 20 miles offshore and thus avoiding both the 'over-falls' or bumpy water that is characteristic of strong tides passing over shallows further inshore. This offshore route not only also respected the shipping channels and turning point around Long Sand but was also more direct and had the advantage of avoiding the many and varied fishing marks and crab pots for which the East Coast is well known. It was only when we entered shallow water approaching Ramsgate that they became a hazard. The open sea passage was some 80 miles and was itself planned to take around 9hrs, arriving at the Ramsgate harbour entrance at low tide turning to starboard to enter the Marina after steering carefully along the buoyed channel until entering. Then and hugging the pontoons on the port side as parts of the marina are drying two hours before lower water on a near Spring tide. Since i was last here, the ferry terminal has become disused and the place looked very sorry for itself! Contingencies: If we had not liked the sea, we could have soon aborted and put into Lowestoft. There was also an alternative refuge of Shotley Marina near Harwich on around the half way mark if problems were encountered and, thirdly, we can also have run at up to twice the planned passage speed without difficulty if needed but with extra fuel cost. In the end we just did a couple of extra knots as The extra crew on Ikon were not used to such long passages and were taken ill.